The last few weeks have been all about stitching chez Boyd. It started with working up sample projects for my new sewing book and then moved on to stitching together a blog header. While I was selecting fabric for the header at Alewives in Damariscotta, I couldn't resist picking up a Modkid sewing pattern. Patty Young designed this gorgeous 'Emma' dress that is actually a versatile skirt and top set. Celia and I had so much fun picking out the fabrics, there's no shortage of inspiration in the gorgeous fabrics that line Alewives shelves. Taking time out to make my own project is always a challenge, there's usually a list of things that need to be made for publication. I rewarded my self with time to work on this dress after I sent the finished stitched header to my sister. She graciously offered to photograph it and add the type to create a logo. I'm anxious to see what she comes up with and finally make my blog official with a handcrafted banner. The last time I made a sewn garment I was pregnant with my son Jasper (who is now 17) and had outgrown all my maternity clothes. What a joy it was to follow this wonderfully clear pattern and settle down to something that wasn't going to be shipped away. It was also a delight to whip something together with just a couple yards of fabric, knitting and sewing for children is the best! I'm curious to see how floaty this design would be in lightweight voiles that are recommended, I might just have to make it in a different colorway. On one of our many trips to JoAnn's for odds and ends I treated Celia to a little felt sewing kit. We had a few relaxing afternoons sitting together, her stitching and me unknotting her tangles. She did surprisingly well and was excited enough to make four different little softies a butterfly, cat, flower and heart. 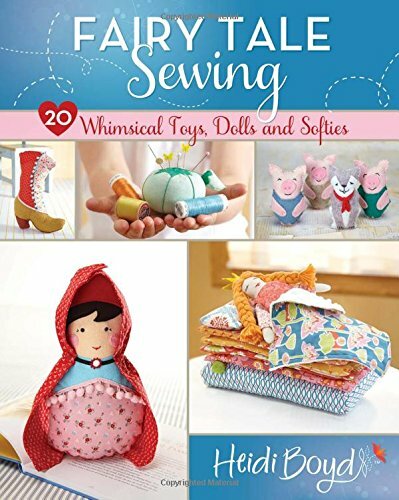 While I was helping Celia stitch and working on her dress, my sewing book passed through North Light books proposal process. I have a deadline of January to make up all kinds of sewn personal and home accessory projects. It looks like this springs stitching frenzy might last through the new year!